We do our best to keep our homes as clean and tidy as possible. Some of us make chore charts and/or maintenance schedules, some of us set aside an entire day once a week/month, and some of us just try to do our best to get to the major tasks when we can carve little bits of time out of our everyday schedule. No matter how much (or how little) effort we put into it, there are somethings we miss. 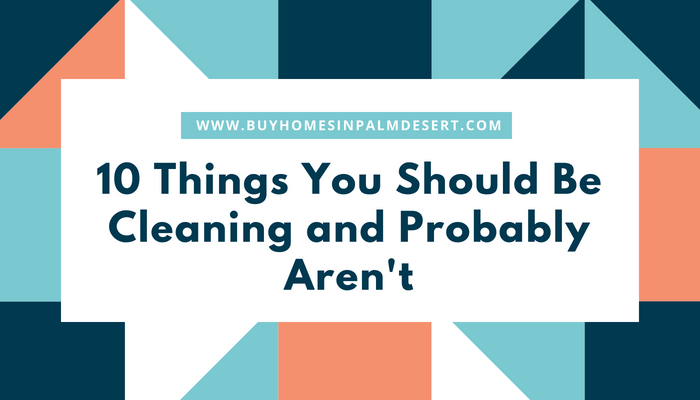 Here are some items in your home you are probably forgetting to clean, and really should be. We are not just talking about pulling the tangled up hair out of your brush right after you run it through your tresses. Over time lint, styling products, and other gunk build up on the bristles of your brush. Regularly clean the bristles of your brush with a cleaner made for brushes or by submerging them in a cup with a few drops of dish soap and warm water. This will get the gunk off your brush and ensure you don’t brush that through your nice clean hair. Ew! Just like the door knobs in your home, your steering wheel is constantly touched by hands. Hands that probably touched many other surfaces full of germs. Reduce the amount of germs on the wheel and maybe even prevent a cold or two with a quick wipe down once a week. Avoid a painful ear infection by cleaning those earbuds. Don’t expose your ear to old gunk that has grown into harmful viruses and/or bacteria. Unless your garbage can is brand spanking new it probably emits an odor even when its empty. This is a sign that it needs a good scrub down. These often get overlooked, but with time you will notice the grate covers on your vents are full of dust and gunk. Wipe them down with a microfiber cloth or grab a can of pressurized air and clean ‘em up. Many, many different bacteria collect on your toothbrush after just brushing your teeth. Think about what is living on your toothbrush after several days, weeks, or months! Soak your toothbrush in white vinegar or run it through the dishwasher. Doormats are made for the purpose of keeping all the gunk from the bottom of your shoes off of the floors in your home. The mat can become so saturated with gunk that the mat is no longer helping, but making the floors dirtier. Give them a good clean once every couple of weeks. Vacuum filters do heavy work. If you are vacuuming properly and regularly once every week or (few days for high traffic areas) of the floor the gunk can build up over time. A dirty vacuum is no longer able to clean the floor. Rinse the filter off and then run it through the dishwasher to get it clean. That’s right scrub the walls, especially if you have small children in the home. They get very gunky and you don’t even realize how discolored with gunk they are because the transition was so minimal over time. But trust us the dirt is there and if you have not wiped down your walls you will be surprised at what color they truly are. This may sound funny, because of course, you are cleaning your carpets. You vacuum when it starts to look gross. First, if you are only vacuuming sporadically that is not nearly enough. Your carpets need routine vacuuming at least weekly. Second, a large number of people never have their carpets deep cleaned by a professional carpet cleaner. It is so important to have a deep cleaning done at least once a year because only professional strength equipment will get to the deepest crevices and clean and sanitize.